January, 2007 - New web shipmates added in January. Burns, Dean 90 - 92; Melancon, Claude 79-81 and 84-85; Vilmin, Wes 68 - 69; Schoettner, Adrian 87 - 88; Klinger, David - Plank Owner 65-68; Ellis, Mike 87 - 89; Andis, Richard 76 - 80; Hall, William 69 - 71; Strause, Robert 83 - 86; Martin, Robert 79 - 82. Check crew list for details. Jan 29, 2007 - We just learned of the passing of Harold A. Wilber, SK1 Plank Owner, Blue Crew. His son Tom notified us that "Wilber", as we knew him, passed in October 1990. Our thoughts and prayers go out to his family. See picture in Eternal Patrol. Jan 17, 2007 - Gary Walters MM2 Plank Owner sent in this article that was featured in his USSVI chapter's newsletter. It is by Dr Joyce Brothers and called "The Submariner". Jan 8, 2007 - On a sad note, we report to you the passing of Gus Peterson, COB Gold Crew mid 70's. Gus was a valued shipmate and will be missed by all that served with him. Our thoughts and prayers go out to his family. Read his obituary in Eternal Patrol. Jan 1, 2007 - We have added a Deck Log to the web site. Feel free to add comments of your days on the Key or comments about this web site, etc. Happy New Year to all. February, 2007 - New Web shipmates added in February. Cooper, Robert 90 - 91; Martin, Giles 78 - 80; Axtell, Miles 80 - 85; Cox, James "Wolly" 72 - 74; deRoxtro, George 88 - 90. Check the Crew List for details. February 17, 2007 - Just put many, many new pictures online. Check out the Photos area. Many more to come soon. February 16, 2007 - Received some nice pictures and a story from Mike Robertson TM2 Gold Crew 69 - 72 showing Gus Peterson in action. Gus recently passed away and you can read Mike's story of Gus and see the pictures in Eternal Patrol. February 8, 2007 - I just noticed that the link to the Ships Store was missing. I added it back to the web site. I don't know how long it was missing so why don't you stop by the store and pick up something, like a Tom Denton painting of the Key. They are only $18.00 and look great on the wall. Tom illustrates many navy vessels but his depictions of the Key are very accurate because Tom served on the Key from 1985 - 1987. All profits go to the Key Reunion Association. 72: Clemens, Marty 72 -75. Check Crew List for details. March 15, 2007 - We received 17 pictures from John Yeiser of the Gold Crew in 1974. John can't remember the names in the pictures. Give us a hand. Click on WHO? March 6, 2007 - Torpedomen get Torpedoed! Harry Baker, a former Key TM sent in this news article regarding the Torpedoman rating. "Another sign of the times. The U.S. Navy is merging two job categories, Gunners Mate (sailors who operate and maintain guns and missiles) and Torpedoman (who operate and maintain torpedoes). Those currently holding a Torpedoman mate job will do the same work, but now be known as Gunners Mates. However, those holding Torpedoman rates can wear their distinctive Torpedoman rate badge for another two years. This merger is no surprise. For many years, Gunners Mates and Torpedomen went to many of the same technical schools. 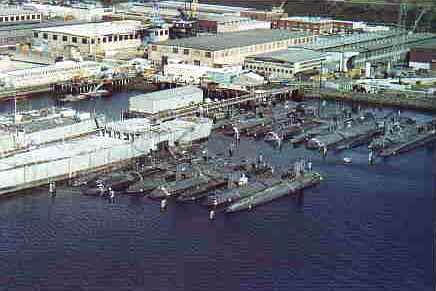 Both rates operated and maintained missiles, for the most part. Torpedoes, which appeared in the late 19th century, were the first guided missiles. Very high tech for their time, they were in service for about three decades before one was actually fired in anger and did some damage. But during the first half of the 20th century, torpedoes were a heavily used, and very effective, weapons. The most expensive missiles are still the high end torpedoes. But missiles that fly through the air have become more capable over the decades, and have replaced torpedoes, and guns, for most anti-ship work. Missiles supply most of the anti-aircraft weaponry for ships as well. It's ironic that sailors called Gunners Mates are now mostly people who operate missiles, rather than guns." March 4, 2007 - A blast from the past. Here are some sounds from the boat that should get your blood pumping again. Can you identify them? The answers are at the bottom of the page. March 3, 2007 - Gary Walters, 65 - 67 Gold, sent in this Key fact from a book called "Dolphin Tales with a dash of salt..."
"In November 1968, the USS Francis Scott Key returned to port in Charleston South Carolina, and thus marked the successful completion of the 600th deterrent patrol of the F.B.M. 's It also marked the equivalent completion of 100 patrol years or one Polaris submarine patrolling completely submerged for 100 years. Since the first initial patrol in 1960 to Nov 1968, over 38,000 days of patrol vigilance have been successfully completed." March 2, 2007 - Well, the Key web site has hit a minor milestone. We just had our 3,000th visitor since the addition of a counter on Sept 14, 2006. I am very pleased to see that former crewmates are visiting the site at a rate of over 500 visits a month. I want to thank all of you that have contributed pictures, sea stories, papers and suggestions. Without these contributions it would be a pretty boring site. I encourage all of you to take an hour and dig through your stuff to find more material. E-mail, fax, phone or snail mail it to me and I'll get it online for all to view. We are the history of the Key so we are the only people that can document it. April, 2007 - New Key web shipmates added in April. Gibbs, Russell 77 - 80; Campbell, Steve 90 - 92; Coleman, John "Lucky" 74 - 81 COB; Pomarez, Mike "Chico" 70 - 74; Knowlton, Robert Wade 72 - 76; Healy, Mike 81 - 86; Stradley, Lee 86 - 90; Yeager, Carl 77 - 80; Browning, Frank 78 - 80; Thompson, Joe 84 - 88. Check Crew List for details. April 5, 2007 - Kevin Malheit, MT3 87 - 89 Blue, sent in some pictures. I put them in the WHO? area and we need your help identifying anyone in them. April 1, 2007 - We had 700 visitors to this web site last month. That's a lot of shipmates that have figured out how to use a computer. Remember, you can leave messages or comments by clicking on DECK LOG. The messages can be about something that happened on the boat; your life now; something you see on this web site; something you would like to see on this web site; "Looking for" messages; or just about anything else you can think of. May, 2007 - New Key web shipmates added in May. Baker, Larry 68 - 70; Roche, Stephen 72 - 74; Eatman, Bryan 90 - 92; Penna, "Connie" 64 - Plank Owner; Miller, Terry 89 - 92; Satchell, Bill 65 - 68 Plank Owner; Summers, Rick 86 - 87; Lewis, Sam 67 - 70. Check the Crew List for more details. June, 2007 - New Key web shipmates added in June. Miller, Dan 68 - 71; Ripley, Mike 65 - 67 Plank Owner; Komac, Matt 66 - 69 Plank Owner; Kjellin, James 84 - 88 Active Duty; Adcock, James 70 - 72; Mooney, Lee 85 - 86; Terrey, Michael 77 - 80; Francisco, Tim 79 - 82. Check crew list for more details. June 20, 2007- We already have 18 shipmates signed up to attend the 2008 reunion in New London with many more expected to add their names soon. If you think you might attend, add your name to the list by e-mailing Al & Diane at diane@ssbn657.com. June 19, 2007 - I just realized that June marks the 1 year anniversary of my maintaining the Key web site. There have been a lot of changes and a lot of material added thanks to you guys who took the time to submit photos and sea stories. It would be a web site full of facts and figures without all of the crew material so keep sending it in. Each submission adds a little more to the history of the crew of the Key. June 6, 2007 - Another new section has been added to jog those memories of the boat: Sub Sounds will make you relive all those drills, and also those chills when they were sounded for real events. June 4, 2007 - The F.S. Key Reunion Committee announces the date of the 2008 Reunion: April 24 - 29 in New London, CT. REUNION 08 has been updated on the web site. Click to read the latest. The date under the link shows the date of the latest change. A list of people planning on attending can be seen by clicking "2008 Attendees" in the left column. See you in New London! June 1, 2007 - I created a new area called "Photos with Stories". These are former Pictures of the Week that have great stories behind them. If any of you guys have a picture with a story to go with it, or if you see a picture on this web site and have a story to go with it, send it in. July, 2007 - New Key web shipmates added in July. Csehy, Bill 77 - 79; Davidson, Charles 77 - 79; Newsome, Phillip 86 - 92; Hole, William 68 - 71; Romanus, Phil 85 - 88; Moreland, John 79 - 81; Hoover, Chuck 74 - 77; Wilson, Gary 71 - 72; Moore, Michael 75 - 84; Hammonds, Michael 84 - 88. Check crew list for more details. July 23, 2007 - Michael Moore mustered on the Key web site for the first time the other day and on his muster form his years on the Key were listed as 75 - 84 and Both crews were checked. I added Mike to the Crew List and then e-mailed him to ask if there was a story behind his tour on the Key. Boy was there. I put his reply in Sea Stories. July 23, 2007 - We now have 25 shipmates already signed up with intentions of attending the 2008 Reunion in New London. If you're thinking of attending, put your name on the list so that your buddies who are sitting on the fence can see it. July 5, 2007 - I've added a collection of halfway night pictures to the Photos area. Check them out. August 2007 - New Key web shipmates added to the Crew List in August. Williams, Clifton - 84 - 87 Active Duty; Moffitt, Chris 74 - 79; Mitchell, Michael 78 - 80 Active Duty; Ivy, Eldon 65 - Plank Owner; Cooper, Roy Dan 81 - 84; Cichocki, Gayle 86 - 90; Cook, Lloyd 86 - 90; Stovall, William 65 - 67 Plank Owner; Shaull, Thomas 81 - 87; Hughes, Larry 83 - 88; Gillilan, Lonnie 86 - 88; Marchand, Ronald 75 - 78; Dougherty, James R. 65 -Plank Owner; Paschall, John 72 - 75; Whetstone, Marty 83 - 88; Stager, John 69 - 71. Check crew list for more details. August 28, 2007 - A big thanks to Ron "Lonnie" Marchand for the two great stories that were just added to the Key Wives area. Check them out. August 27, 2007 - Created a new area called Qual Cards. The Key web site is the perfect place to enshrine your most prized possession - your hard earned Qual Card. Dig it out, get it scanned and send it on in. August 24, 2007 - William Stovall reports the death in 2004 of James R Dougherty, RM2 Plank Owner. Read Williams tribute to James in Eternal Patrol. Also, Ron Marchand has written a tribute to Gus Peterson in Eternal Patrol. August 14, 2007 - Some alert shipmate has just noticed that I had the wrong date for the next Reunion in April 2008. I had Thursday April 24 to Sunday April 29. Well it should say Thursday April 24 to Sunday April 27. September 24, 2007 - We now have 35 Key shipmates who have registered their intensions of attending the 2008 April Reunion. If you are thinking of attending, please let us know so that we will be sure to get a facility big enough to hold us all. Click on Reunion 08 for more details. September 18, 2007 - Received some nice pictures from former Key CO William Rogers, Gold Crew 89 - 92. I put them in the 1990's photo area. September 14, 2007 - One year ago today I added a counter to the web site so that I could see if anyone at all was visiting. This morning the counter reads 8003. Now several hundred of that number is me going in to check the site every time I make a major change, but the vast majority of visitors are you guys. We now have over 900 names on the crew list and a good number check the web site regularly. I will continue to add material to keep it interesting but I need your help. Keep sending in those pictures and sea stories. Contribute material wherever you can - and thanks for visiting. September 12, 2007 - I was visiting www.legacy.com where you can look up recent obituaries (boy was I having a boring day). I put in "SSBN 657" and two names appeared. Dooley, Joseph P. who was a TMC plank owner on the Key and Gaut, Robert "Bob" MT 75 - 76 Blue Crew. If anyone remembers Robert Gaut, please send in some details for the Eternal Patrol area. Joe Dooley is on the crew list so if any of you plank owners remember Joe, e-mail us some stories. September 1, 2007 - September marks a couple of sad days in the history of the Key. 12 years ago today, the Key ceased to exist. 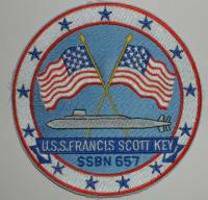 "USS Francis Scott Key SSBN 657 was decommissioned on 2 September 1993 and stricken from the Naval Vessel Register on 2 September 1993. 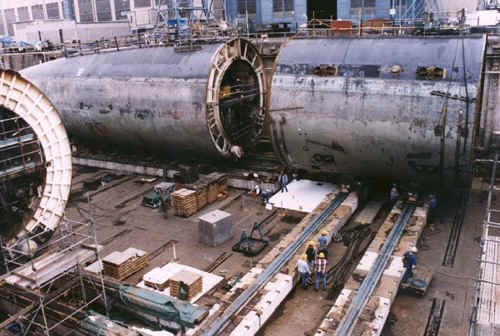 Ex-Francis Scott Key entered the Nuclear Powered Ship and Submarine Recycling Program in Bremerton, Washington, and on 1 September 1995 ceased to exist". 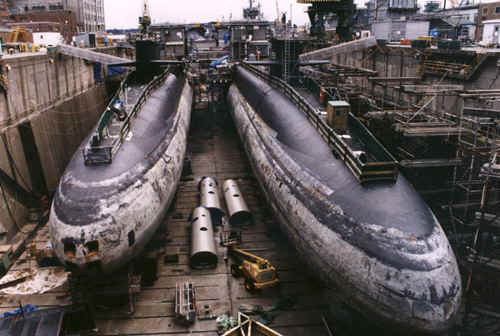 (Key waiting to be scrapped Picture 1 Picture 2) (Key in cutting dry dock. Key in pieces). The reason I chose the picture of the Key you see above during an emergency blow drill is that it signifies to me the rising of the Key from that Bremerton scrap yard and back into the hearts of the men that served on her. October 2007 - New Key web shipmates added in October. Cockey, Alex "Sandy" 74 - 76; Teckett, Donald 85 - 87; Dike, Ted 71 - 76; Sechriest, Steve 86 - 89; Vickers, Donald 79 - 81. Check the Crew List for details. October 22, 2007 - I just learned of the passing, on April 4, 2007 at 58 years of age, of Robert Berst. He served on the Key from 1977 - 1981. I put his obituary in the Eternal Patrol area. If anyone remembers Robert, please send us along some information for his Key Eternal Patrol area memorial. October 15, 2007 - We received an e-mail from Stephanie Pyne-Esler, the sister of deceased shipmate Denny Pyne. She found the Key web site while surfing the net and also saw her brother listed in the Eternal Patrol area. Stephanie sent along some details and warm remembrances of her brother Denny. I have included them in the Eternal Patrol area under Denny's name. November 2007 - New Key web shipmates added in November 2007. Borrell, Milton "Skip" 65 - 71 Plank Owner; Richey, John 72 - 74; Singer, George 64 - 68 Plank Owner; Carter, Dave "Otis" 80 - 83; Anthony, David - 1971; Cooper, Joseph 67 - 71; Krooner, Bradley 78 - 82. Check the Crew List for details. November 21, 2007 - We want to wish all former Key shipmates and their families a very happy and health Thanksgiving 2007. November 20, 2007 - I just reformatted the Eternal Patrol area and add pictures where we had them. If you have any pictures of a person on Eternal Patrol on the list, please send them in. November 16, 2007 - OK all you plank owners, try to pull your heads out of that alcohol induced fog and take a look at the WHO? photo area and see if you can recognize anyone in the photos sent in by Joe Heflin. They are probably half way night blue crew during one of the first patrols. If you recognize anyone, let us know. "Let's all take the time to say thanks!!! Something cool that Xerox is doing. How AMAZING it would be if we could get everyone we know to send one!!! This is a great site. Please send a card. It is FREE and it only takes a second. - Thanks, Jeff." November 9, 2007 - Jeff Burke, RM1 Blue crew has sent in 31 great pictures from 1986 - 87. Check them out in the 1980's Photos area. November 8, 2007 Shipmate Joe Heflin - Plank owner - has written some remembrances of his former roommate MT2 Nick Barth who died in 1968 in a hunting accident. Read Joe's stories of Nick in Eternal Patrol. December 29, 2007 - Want to wish everyone a Happy New Year. As I remember New Years on patrol, there wasn't much of any celebration. All it meant was that at midnight we switched to a new log book and went on with the watch. In 2008 we get to look forward to the reunion in New London in April. If you can, please try to attend at least part of the reunion. It will make you feel like you are in your 20s again. December 24, 2007 - Wishing all Key shipmates and their families a merry and healthy Christmas. I spent 4 Christmases on patrol on the Key. I recently found my Key qual cards and on my Practical Factors qual card on December 25, 1970 I got these sigs: "Override solenoid hydraulic and pneumatic control valves; Blow San 1, 2,3 or 4; Unload a loaded .45 caliber pistol; Shift a ventilation damper; Start or secure a ventilation fan or heater; Pump a bilge with an aux drain pump; and Don an EAB mask. I had a very busy Christmas Day in back in 1970. All I want for Christmas is a 10 point sig on my qual card. How things have changed. Christmas 1968 my first patrol, just made 3rd class but officially not till Jan 1, so I was on the 4 days of mess cooking. I think mess cooking was required. for all E-3 and below. Fire (or a detectable facsimile thereof) in the galley - when isn’t something issuing some kind smoke in the galley? Anyhow the ANSUL fire control system went off and covered the galley in chemicals including all the turkeys sitting in pans on the stove top, and the gravy and the….everything about to be served, with ANSUL (white, not blue). With Christmas dinner in ruin, we substituted a French dish instead which we called "Penees d'estallion". December 14, 2007 - I just received notice of the death of Dave "Otis" Carter, FTB1 Gold Crew 80 - 83. You can read more in Eternal Patrol. We wish Dave's family our deepest sympathies at our shipmates passing. December 5, 2007 - Scroll down this page to view the Picture of the Week. "DAY 1"